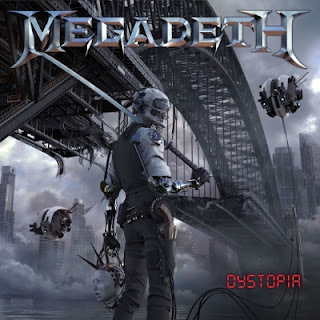 LOS ANGELES, Dec. 8, 2015 /PRNewswire/ -- MEGADETH has announced today the details for the North American leg of their Dystopia World Tour, which will kick of in Dallas, TX on February 20, 2016. The North American leg will take them across the U.S., visiting 14 states and throughout Canada. Tickets for the Dystopia World Tour start going on sale Friday, December 11 – check www.megadeth.com for specific market info and local on sale times and dates. There will also be an exclusive pre-sale for MEGADETH fan club members on December 8 at 10:00 am local time with details also available at www.megadeth.com. MEGADETH will be on tour in support of their new album Dystopia being released on Universal Music Enterprises /Tradecraft / T-Boy Records on January 22, 2016. Along with band visionary Dave Mustaine at the helm, MEGADETH's current touring lineup will be Kiko Loureiro (formerly of Angra) on guitar, David Ellefson on bass, and drummer Chris Adler (Lamb of God), all who are featured on the new album. Joining MEGADETH on the North American leg of the Dystopia World Tour are very special guests Suicidal Tendencies, Children of Bodom and Havok. MEGADETH burst onto the scene thirty years ago, virtually inventing a genre with their debut album Killing Is My Business… And Business Is Good! (recently recognized by VH1 as the Greatest Thrash Metal Debut Album of All Time) sold more than 38 million albums worldwide, earning numerous accolades including 11 Grammy® nominations, scoring five consecutive platinum albums—including 1992's two-million-selling Countdown to Extinction.